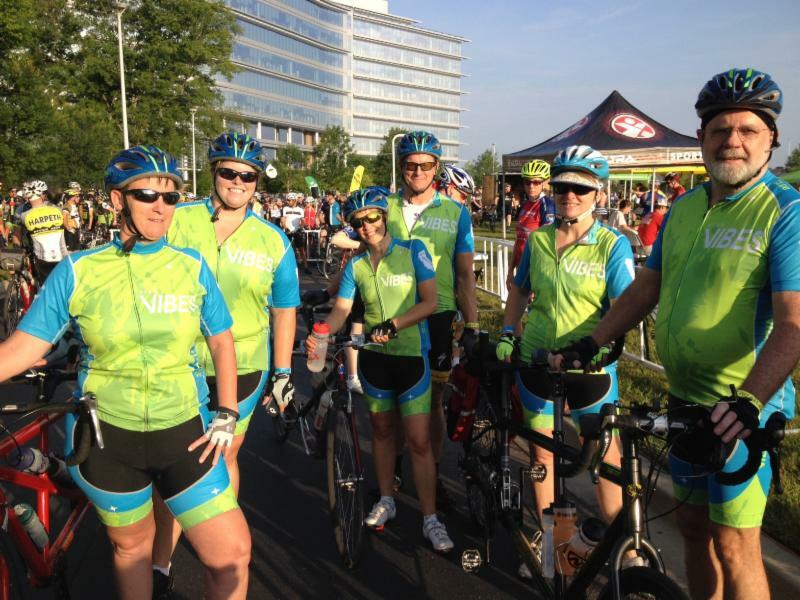 On Saturday, June 21, four Club VIBES tandem teams rode in the 19th Annual Harpeth River Ride outside of Nashville. The Harpeth Bicycle Club is very active in the adaptive athlete and Wounded Warrior programs. Our teams joined dozens of other adaptive athletes following special guest Levi Leipheimer, pro cyclist, leading off the ride to the cheers of the 1500 other participants. 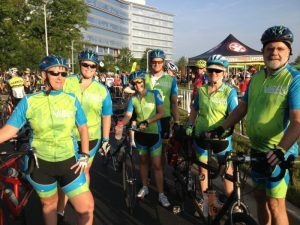 The Harpeth River Ride offers four choices for riders; twenty-five, forty-five, sixty and one hundred mile routes that are marked and supported by volunteers with food and drink at rest stops. Rescue vehicles patrol the routes, and a hot lunch waits at the finish line. We felt very honored and supported all along the way. I’m a VIBES-newbie, and I had the privilege to have James East as my pilot. We completed the 45-mile route, along with Sue Buckley and Leah Smith. Tandem-sensations, Valerie Kuentz and David Hoffman, and Greg Miller and Tim Jones showed their stuff on the 100-mile course. The entire VIBES contingency came home happy, tired and stylin’ in their new club jerseys. I recommend that anyone interested in participating in an event ride give this one a try. It was well-organized and supported and had a positive, fun atmosphere.